The outer castle wall and towers is mostly a combination of stone slabs and cobblestone. Also, some parts of the castle wall has wood and fences for accent. 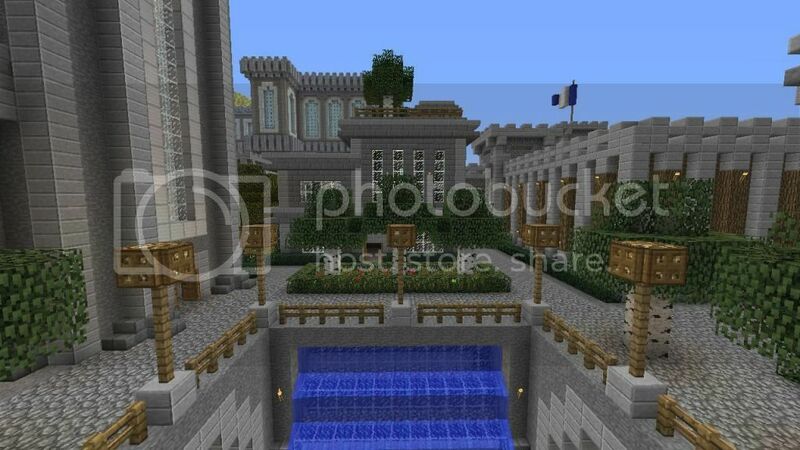 The royal palace is a combination of stone slabs, smooth stone, iron blocks and glass. I used lime wool, gold, diamond and lapiz azuli blocks for the design of the stained glass. The stained glass design is actually not next to the glass, it's one block away. When you put glass in front of colored blocks, the colors is not discernible. I also put glowstone outlining the stained glass design so it will be lit up at night. Thank you - thats very helpful! Look forward to your new creations after the update. Will you be starting a new world to enable the use of the new items in the update? If you need any help collecting resources and building, I would be happy to help. I don't think I'll be starting a new map because I can pretty much recreate everything that the new updates offers once creative mode comes out. If I do start a new map, it won't be until I fill up my current map. I could always use some help from people since I have so many large, unfinished projects. My gamertag is HairyJackass. Wow. That is very impressive. Very well done. Will it have a prison as well? I'm not sure if all castles have prisons but the ones I've been to in Wales do. What country are you from, btw? Yes, my castle will have a prison and a dungeon. I will also have a network of undeground tunnels and water canals that will be linked to the waterfront area of my castle. I'm from the United States. wow a griefers dream, lol but that's amazing. I'm happy about that. How do you know about castles if you're from the US? The US doesn't have any castles (not proper ones, anyway). Have you done any research on what you're building or are you just winging it & building it however you want? I didn't do any research for my castle build. I've pretty much winged the entire build and I come up with ideas as I'm building. Completely in awe.... I may never build a castle... LOL! Or "steal" some of what you did. How did you make thee dam work? That's something I would like to try. Probably one of the funniest things I've ever read. "How do you know about castles if you're from the US?" I've seen this thread quite a few times and always ignored it, thinking "Another castle, big deal." But, when I noticed how many posts it was getting, I started to wonder what all the hubbub was about. Well... I can now see what all the hubbub is about. This is very impressive, I can't wait to see it finished. Same here. I've seen this thread quite a bit, never decided to take a look. I'am definitely impressed. Its beautifulll!!! I wish that was in my map. Will creative be used after the update? Yes, creative is will be used once the update is released. I'd be crazy not to use it considering how large my builds are. awesome! have you thought about incorporating a draw bridge? That is amazing work man. Even when Creative mode comes out I don't think I would be able to touch it. Great eye for detail and scope. Wow, these are amazing! I admire your creativity I'm defiantly inspired! I'd love a tour and be able to assist you with your projects. My Fiancee will have his mind blown when he sees your builds, he loves huge structures and these are seriously the best ones I've seen so far. You and everyone who lent a hand did a super amazing job! I'm still awestruck. 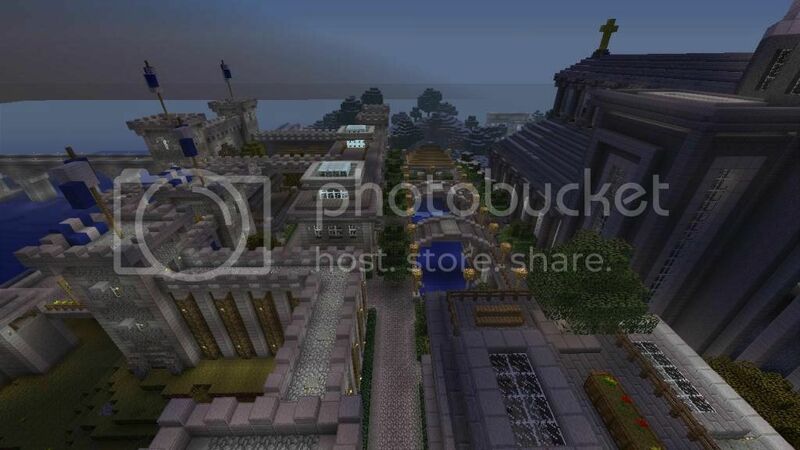 I haven't posted in awhile but here are some current screenshots of my castle. Very, Very impressive. You sir are a true artist! Keep up the great work and don't stop feeding us those screen shots.